Rotation nurses in the Upper East Region have declared an indefinite strike over unpaid service allowances. 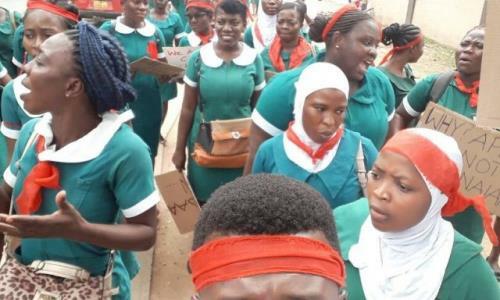 About 147 nurses at the Bolgatanga Regional hospital in the regional capital joined their colleagues in other districts to strike on Monday, 5 November 2018 to compel the government to pay their arrears. This strike follows that of other rotation nurses in the Eastern Region who began theirs last week. The nurses, who said they had not been paid for the past eight months, converged on the administration block of the Central Hospital and chanted songs.